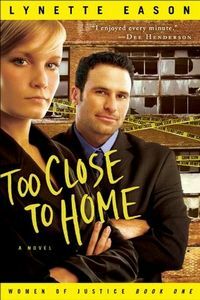 Too Close to Home by Lynette Eason: Synopsis and Online Purchase Options. Synopsis (from the publisher): Samantha Cash is the FBI's secret weapon. Her methods are invisible, and she never stops until the case is closed. When missing teens begin turning up dead in a small Southern town, Samantha is assigned to help local chief Connor Wolfe find the killer. And he has two problems with that. There's her faith — in God and herself. And then there's the fact that she looks exactly like his late wife. As they get close to an answer, the case becomes personal. The killer seems to be taking an interest in Connor's 16-year-old daughter, who thinks her dad is getting way too protective. Can't a girl just have some fun?